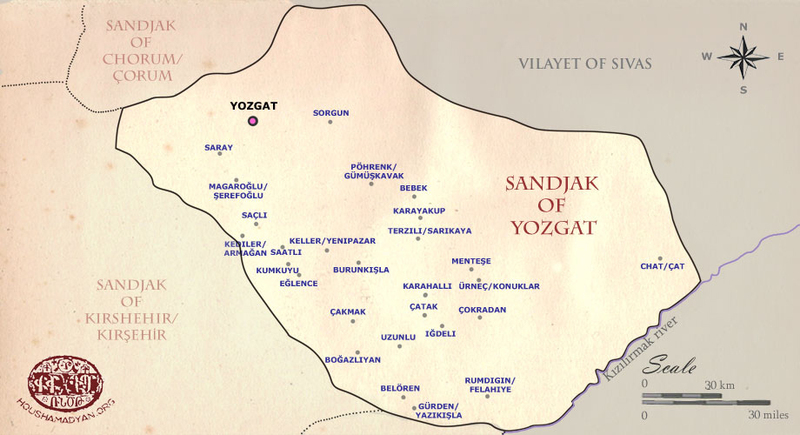 Under the title of ‘Yozgat district’ (sandjak), Houshamadyan turns its attention to a relatively less well known geographical area in the general history of the Armenians of the Ottoman Empire. This sandjak does not form part of the area historically settled by Armenians in the Ottoman Armenian world. The names of places noted, such as Rumdigin (currently Felahiye), Burunkshla (Burunkışla), Iydeli (İğdeli) and Uzunlu will, for many, seem totally foreign. The centres near Yozgat, such as Kayseri (Gesaria) and Sivas (Sepastia) had, from the 11th century, large Armenian populations that had immigrated there from the Vasburagan and Ani regions. Despite this the Armenian history of Yozgat and the villages of surrounding area is relatively new. It is considered that Armenians first settled in those areas mainly from the 18th century onwards. Since those times there has been a lively Armenian life in the town of Yozgat and the surrounding villages. The local history created over several centuries in the Yozgat area forms, without doubt, part of the rich Ottoman Armenian legacy and, through it, part of the general inheritance of present-day Turkey, bearing in mind that these areas are within Turkey’s boundaries. It is Houshamadyan’s aim to reconstruct the past Armenian life of the sandjak of Yozgat, which is part of the province (vilayet) of Ankara, in all its aspects.